Post #2 for the LITTLE things are a BIG deal meme. It's easy to link up and share your story. [copy/paste the button (above) in your post or sidebar. 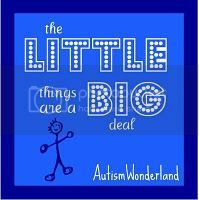 Refer to my blog in your post & link to my current "the LITTLE things are a BIG deal" post. Link your post with Linky Tools.] For information click HERE. You do not have to be a special needs parent to link up. 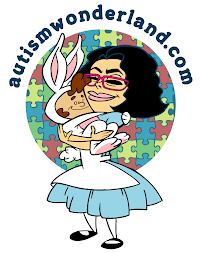 AutismWonderland is a community. And I want to celebrate your every day wonderful moments with you. I don't get much sleep. The Boy wakes up most nights and either plays or decides he wants to sleep in our bed. We have a queen size bed. The Boy will be six in a few weeks. He's a big kid and takes up a lot of space in our bed. Even on the nights when The Husband falls asleep on the sofa (xbox controllers in hand), The Boy takes up most of the bed. And I often wake up cramped in a corner only to look over and see The Boy - arms and legs sprawled. I know, I know, I should put him back to his own bed when he wakes in the middle of the night. But it's pointless arguing with a child who wants to be up when you want to sleep. And when I try to get him to go back to his room we spend the night going back and forth between beds. No one wins. So why fight? So I go against my own rule: never let your baby/child sleep in your bed. Thing is? When The Boy was a baby he never slept in our bed. Ever. We put him to sleep in his crib from the first night we brought him home from the hospital. He was good sleeper. Until he turned two years old. We haven't really slept through the night since. In the beginning I did try putting him back to his bed. No words, no eye contact, just marching him back into his room. But we'd spend hours going back and forth. After a few weeks, I waved the white flag. If (sort of) getting a good nights sleep meant having The Boy sleep in our bed, then so be it. I've been hoping The Boy would eventually grow out of it. Very early Saturday morning, The Boy came into our bed. He lay across the foot of the bed. But he's getting tall enough that his feet are starting to dangle. He wedged his way between me and The Husband. The Boy had a hard time, spreading out and getting comfortable. This went on for almost twenty minutes. And then The Boy got up. I heard him kind of sigh with annoyance. And stomped into his room. It was about 5 am and I thought he would play in his room. But The Boy was too quiet. And that's never really a good thing, unless I know for sure he's sleeping. So I had no choice but to get up and see what he was up too. The Boy was asleep in his own bed. Was this the turning point? Would The Boy now realize our bed wasn't big enough for three? I kissed his forehead and whispered 'good job' for putting himself back to sleep. And then last night/very early in the morning around 1 am, The Boy came crawling into our bed. And he tossed and turned trying to get comfortable. Once again, he stomped out of our room. I listened, wanting to make sure he went back into his room. This time he headed into the kitchen. I walked out and when I saw him, I cleared my throat. I gave him The Look. The Boy turned around, marched back to his room and into his bed. I knew that I had to lay with him so that he could fall asleep. And he did. I woke up again at 3 am. I hate sleeping in The Boy's bed. It's not very comfortable. If I had known at the time of purchase, I would be spending so much time in his bed, I would have splurged and gotten one of those memory foam mattresses. Anyway...I realized The Boy was gone. Oh well, The Boy is getting it (sort of).